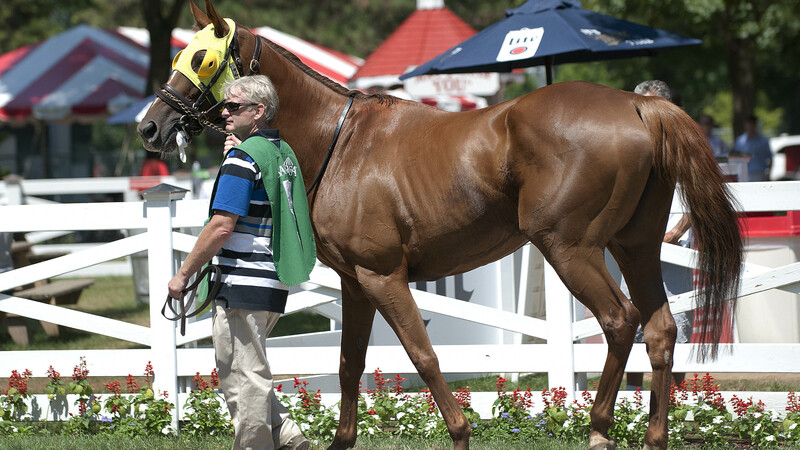 Fall Colors, a 7-year-old mare owned by Bruce Smart Jr. and trained by James Day, was involved in a fatal incident during the $75,000 Mrs. Ogden Phipps Stakes steeplechase held at the Saratoga Race Course in Saratoga Springs, N.Y., on Aug. 3. The Mrs. Ogden Phipps Stakes was the first race of the day, at a distance of 2 1/16 miles over hurdle fences and open to Thoroughbred mares 4 years and older. Fall Colors was in the lead approaching the second fence, where she fell. No injures were reported for jockey Keri Brion. Fall Colors before the race at Saratoga Springs on Aug. 3. Photo by Tod Marks.